Welders and cutting-machine operators welcome with open arms new technology that makes their days more productive, safe, rewarding and enjoyable. But such joy and appreciation can quickly subside when improved productivity and throughput comes with added shop noise and dirtier air. Ducting from Fast Manufacturing’s Mazak laser tube-cutting machine leads to a Farr Gold Series GS8 dust collector, located outdoors. Such was the case at agricultural-industry supplier Fast Manufacturing, Mountain Lake, MN, a manufacturer of pull-type sprayers and liquid-fertilizer application equipment. As the market for such equipment has surged since 2008, according to Fast general manager Clay Roll, so has the firm’s fabrication and welding capacity. In 2009 the firm added 4800 sq. ft. to its main fabrication building, which houses 25 manual arc-welding booths. 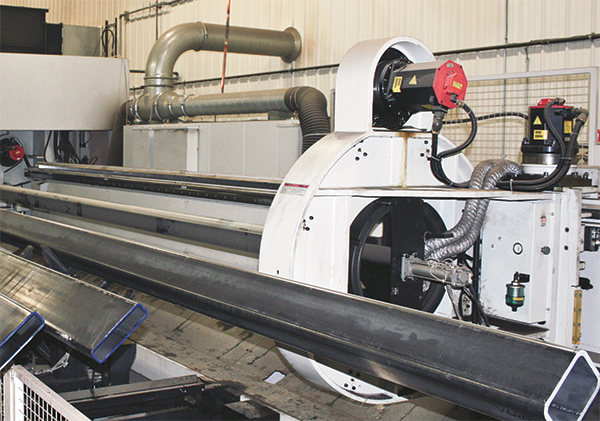 In 2011, a second adjoining production facility welcomed a new plasma-arc-cutting table, and in January 2012 a new 4500-W laser-cutting machine. Finally, in December of 2012 the firm acquired a second 4500-W laser-cutting machine, replacing the plasma table. And, a third adjoining building features a 4000-W laser-cutting machine designed to cut tubes and structural sections. Fast processes structural-steel plate and sheet 16 gauge to 2 in. thick, and tube ¾- to 10-in. square. From left to right, seen outside the Fast trio of adjoining buildings: a Farr Gold Series GS8 dust collector installed in 2009 to tackle weld fumes; a GS16 installed in 2011 that captures laser-cutting dust and fumes; and a GS6 installed in 2012, also for laser-cutting fumes and dust. Also significantly improved, notes Camfil APC specialist Jon Ladwig, is the amount of noise generated on the clean-air side of the dust- and fume-exhaust system. Ladwig and Camfil APC metalworking market manager Greg Schreier designed the system for Fast. When Fast cleared the air of its weld shop, it also tackled the tube-production area by installing another GS8 dust collector. Gold Series units feature vertically mounted cartridges with a cone in the center of the cartridge that, says Schreier, expands the amount of usable media in the filter by as much as 25 percent compared to other horizontal cartridge-filter models. As if the improved environment and energy savings (all four dust and fume collectors allow warm, clean air to recirculate back inside the adjoining buildings) weren’t enough to justify its air-handling investment, Fast appreciates the low maintenance requirements associated with the new equipment—specifically, filter life.